The presence of Catholics in Battambang dates back to 1790 when Catholics from the settlement of Prambey Chhaom along the Tonle Sap fled from a raid by the Siamese army. They wandered around Pursat and Kampong Svay until a Franciscan named Jean of Jesus regrouped and installed them at Battambang. These groups of ethnic Khmer, Chinese and Vietnamese Catholics gathered for regular prayers on present church grounds, sometimes even without a priest. In more recent history, the Catholics suffered much loss and pain during the Democratic Kampuchea (DK) regime from 1975-1979, when religious practice and faith was made illegal. Many were killed. 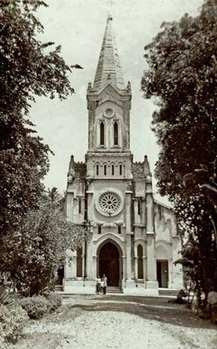 In Battambang, the original church structure was destroyed; the compound and surrounding lands were confiscated for different use. Some Catholics fled to the Thai border as refugees. During the 1990’s after the war, Bishop Ramousse came back to Battambang. He dialogued with the military who occupied the compound to allow the church to buy back the land. Thanks to his efforts and vision, the church reclaimed most of its former land and slowly began to rebuild again. Despite many trials, the present Catholic community persists and now regathers scattered people, recalls and relives old memories and keeps herself abreast with a new mission. We invite you to take part of our unfolding story as we now face the challenges of our time. Source: Ponchaud, Francois. The Cathedral of the Rice Paddy: 450 Years of History of the Church in Cambodia. Cambodia; Fayard, 1990.